Politi-naps: from Game Jam to Release! It’s been a while since our last post – we’ve had lots of learning and work to do! These days our limited time is mainly focused on our major project; however to get some experience finishing and releasing a game, we decided to work concurrently on one of our old game jam creations – Politi-naps. Politi-naps was born in 2016 from the theme “Election Special”. Being a casual-minded group, rather than going down the potentially boring track, we decided to create something a bit fun and cute. 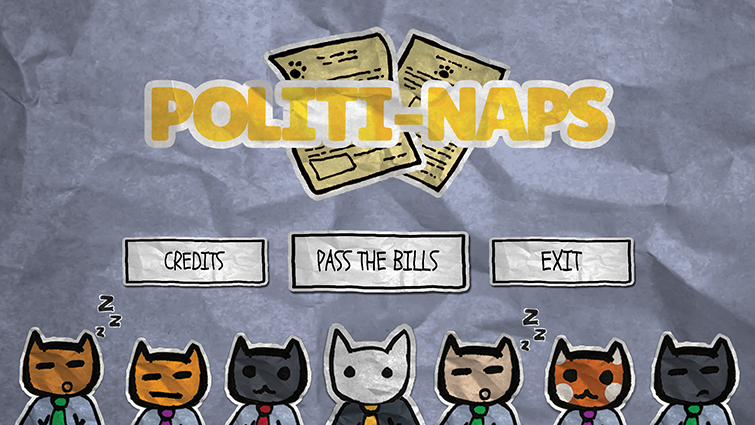 Politi-naps is an Android mobile game, where the player must keep the Politi-cats awake so that they can pass some important bills (like making dogs pay for walls or legalising catnip). Our focus was to create something cohesive but simple, so we decided to implement a 2D game using touch controls. One of our team goals was to make sure that we created all of our assets from scratch, including art, animations, sounds, and all code. One of our team goals was to make sure that we created all of our assets from scratch, including art, animations, sounds, and all code. As this was the very first game jam with all of the original Myriad team members, the biggest challenge for us was to understand how we all worked together in order to produce something we all liked. We spent a LOT of time on the first day discussing potential game ideas, mechanics, themes (and other eventually unimportant details), only to settle on our current game mechanics almost at the end of day one! From that time forwards we buckled down and ended up with a somewhat-working build at the end of the jam. After demoing the game to the TasGDS collective (and receiving some encouraging feedback – thanks guys! ), we decided that it would be a good candidate to work on and release, while working concurrently on our major project. Even though we weren’t planning on releasing a bunch of mobile games, the process to get from prototype to polish to complete was foreign to us, and this game was the perfect opportunity to attempt releasing our first game. Over the course of many weeks allocating a few hours here and there, we added new functionality, altered existing functionality to improve user experience, and polished the art style to a point where we were happy to show the game to some friends around us. We implemented our own testing process, making sure that we had a good look at each build, prioritised any issues, and iteratively fixed the issues that we found. During this development process, there certainly were a number of challenges that we had to overcome. The main thing we learned from the game jam was to time-box the design process. We spent so long agonising over small details, that we couldn’t decide on anything solid, resulting in almost one day less development time… yeah we know, that’s not good for a weekend only event! The main thing we learned from the game jam was to time-box the design process. Another issue we came across was that refactoring game jam spaghetti code takes a LONG time. Going through this process made us understand the importance of designing the system before implementation, or in the case of a game jam, at least considering the goal of the game and if it is worth structuring in a way that means it’s not a tangled mess at the end of the weekend. Ultimately, we learnt that refactoring code can take a long time, and it gets tedious. 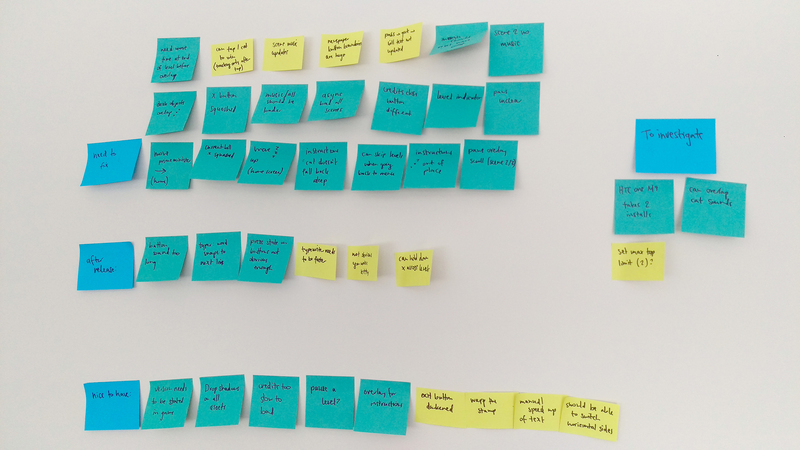 Coming up with the idea is the fun part… restructuring and fixing small issues: not so much. It was hard for us to realise that we couldn’t release a “perfect” game, so it was good practice for us to emotionally separate from the game, and look at it objectively. Having a goal for the release was critical for us to understand when the build was “release ready”.